We believe that true success comes from discovering your unique path. Picture a high school where excellence reigns supreme – a school for all who thirst for knowledge and personal fulfillment. Imagine a culture where superior academics go hand-in-hand with the arts, athletics and the development of each individual student. Here students have the acceptance and guidance to realize their strengths, passions and purpose. Welcome to Trinity Episcopal School, a place where students can follow their dreams and Discover their Paths. Trinity's small class sizes, individualized instruction and challenging core curriculum are only part of the Trinity story. 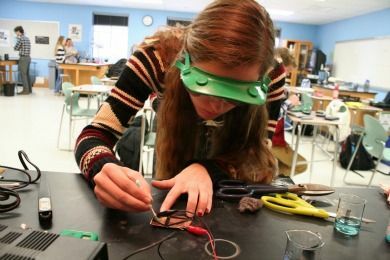 Trinity also offers an International Baccalaureate (IB) Diploma Program, a wide selection of Advanced Placement (AP) courses, and many enriching and unique programs. Whether a student's passion is academics, athletics or the arts, Trinity truly has something for everyone. Our charge is to challenge Trinity students to discover their paths, develop their talents and strengthen their character within a dynamic academic community. Realizing that freedom and individual growth occur best within an environment of order and mutual respect, Trinity Episcopal School abides by codes of honor and conduct. We expect students, faculty, parents, administrators and staff to respect the integrity of the community, to act responsibly and to support one another for the betterment of each individual and of the entire school.